This salmon recipe has been my family's go-to grilled salmon recipe for the last decade. Whenever we host guests for dinner or a picnic over the summer, we fire up the grill and get the dry rub prepared. 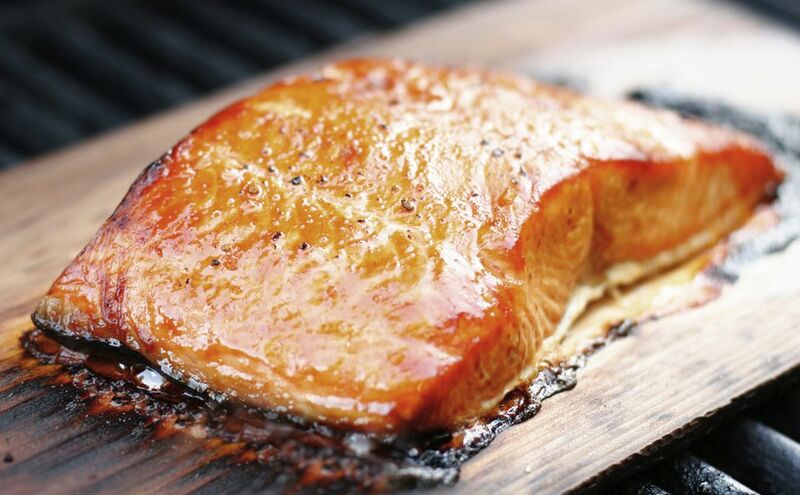 This naturally gluten-free salmon recipe is something special, both sweet and spicy with a caramelized touch from when the brown sugar meets the heat of the grill. The dry rub consists of brown sugar, chili powder, cumin, paprika, coriander, salt, pepper, and orange rind grated with a zester (one of my favorite kitchen tools). The dry rub is sprinkled over four salmon fillets, about 4-6 ounces each, then topped off with juice squeezed from an orange. For this grilled recipe, you want salmon fillets with the skin still on the fillet, which helps hold the salmon together as it cooks on the grill. Grilling this salmon is easy and hands off. Heat the grill to medium-high and brush the grates with olive oil. Once the grill is hot, arrange the fillets skin-side-down on the grill. Cover. Cook. That's it. Salmon fillets 1" thick cook in about 8-10 minutes. For each additional inch of thickness, cook for an additional 8-10 minutes. The salmon is done when the flesh flakes easily. Remove the salmon from the grill by inserting a spatula between the salmon flesh and the skin, removing just the salmon and leaving the skin on the grill. Serve immediately with your favorite gluten-free summer side dishes and a patio perfect cold cocktail. In a small mixing bowl, combine the brown sugar, spices, salt and pepper, and grated orange rind. Mix until well combined. Rinse the salmon fillets and pat dry. Arrange the fillets skin-side-down on a baking sheet or a large dish. Divide the brown sugar-spice mixture amongst the four fillets, sprinkling the mixture evenly over top each. Squeeze juice from one orange over the salmon fillets. Set aside to marinate while the grill is pre-heating. Heat the grill over medium-high heat. Brush the grill grates with vegetable or canola oil. When grill is hot, place the fillets skin-side-down on the grill grates. Cover and cook for 8-10 minutes for one inch fillets. If fillets are thicker than one inch, cook for additional 8 minutes, or until salmon flesh easily flakes apart. With a spatula, remove just the cooked salmon portion from the grill, leaving the skin on the grill or removing the skin and setting it aside once salmon is placed on a clean dish.